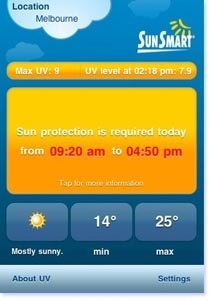 While around the season of thanksgiving day in U.S, thanks for one more in Australia for the new App - iPhone, the first ever SunSmart iPhone application making it easier than ever for Australians to be SunSmart this summer that aids protection against the ultraviolet rays. than ever for everyone to build sun protection into their daily routines. 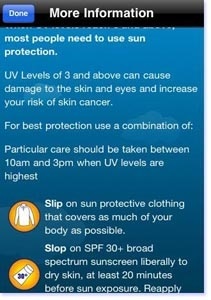 Whilst lots of people love the outdoors the UV levels are likely to reach extreme levels over the next few months, so people need to know when to use sun protection." 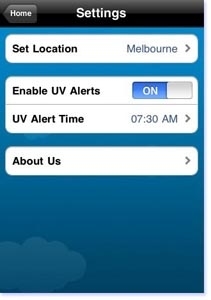 "What we're finding is that a lot of people are using temperatures and weather to predict when they need sun protection, but it's really the ultraviolet (UV) that's a problem -- and you can't see that or feel it,"
The council developed the free app that provides a daily weather forecast, including the maximum UV levels as to reach young people who tend to be less stringent with sun protection. It has an alert function and uses global positioning systems (GPS) to automatically adjust to the user's location, showing the times for which sun protection is needed as well as an automated UV warning and an up-to-the-minute guide to UV levels. Skin cancer is Australia's most prevalent cancer but, ironically, it is also one of the most preventable. By checking the UV level each day before heading out and noting the times of the day that sun protection is required, people can take the necessary steps to make sure they play safe in the sun this summer. 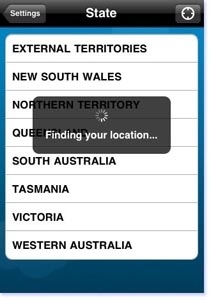 Though there are Instruments out there to detect the environment study but "the nice thing about the app is that you can carry it where ever go noting that this makes it especially handy for people who work outdoors for long periods and are especially at risk."